There's a veritable ocean of untapped power beneath your feet. Vycon Energy, which makes industrial flywheels, says it has come up with a way to harvest energy from subway cars and light rail trains that could help large cities cut their power bills, and even help avoid peak power emergencies. The technology works on the principle of regenerative braking. Speeding trains carry a lot of kinetic energy, which currently goes to waste when the trains slow down to stop at a station. By connecting a flywheel to the rail system, that energy could be converted to electrical power, which in turn would then be used to get the train moving again. It's the same idea Toyota and other car makers exploit for hybrid vehicles. The difference is that the power generated would reach into the megawatts. A 10-car subway train in New York’s system might require a jolt of three to four megawatts of power for 30 seconds to get up to cruising speed, according to Louis Romo, vice president of sales at Vycon. That’s enough to power 1,300 average U.S. homes. And when one train leaves the station, another one comes in right on its heels. While delivering walloping surges in power like that to downtown stations is feasible, remote stations can experience drops in power. Train departures have to literally be staggered to accommodate the availability of power. “Almost every rail company in the U.S. has a station where voltage sag is a problem,” said Romo. Vycon claims it can help smooth out this problem by effectively getting the trains to act like Priuses. When drivers hit the brakes on their hybrids, the kinetic energy of the moving car gets transformed into electric power that then gets stored in the battery. In Vycon’s plan, a decelerating subway train could generate up to four megawatts of energy that would get sent to twirl the company’s Regen flywheel. The flywheel wouldn’t be located on the train. Instead, a bank of flywheels would be housed at the station: the train would send the power via the electric third rail. When the train leaves the station a minute or so later, the energy in the flywheel could be transferred to the electric motor on a train. Sacramento, Denver and Los Angeles are currently in discussions with Vycon about possibly conducting a trial. At the same time, the need to modernize the grid with energy storage and shave peak power has prompted innovation in new products and services. Beacon Power, for instance, erects flywheel farms in which arrays of their own flywheels help utilities smooth out the delivery of power. In general, flywheels work best when short, powerful bursts of power are required, said Romo. Flywheels in a sense hold energy more than they store it. Batteries, by contrast, get deployed for storing power over longer periods of time. Vycon’s twist in flywheels involves producing gear for hard-to-reach environments. 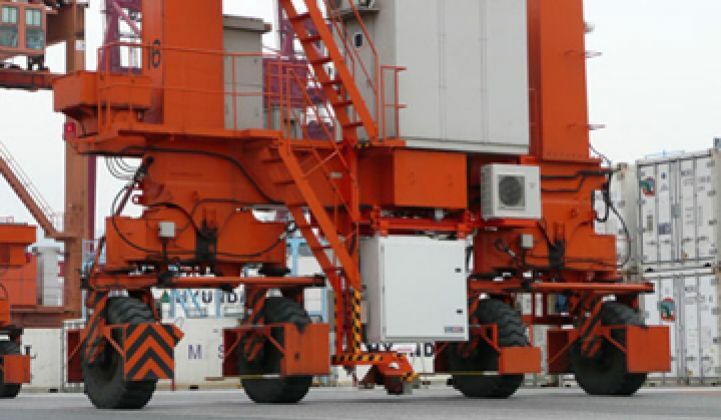 It sells flywheels for cranes in ports, for instance. Most port cranes run on electric motors, but get their power from diesel generators, not the grid. A filled 30-ton shipping container can generate about 200 kilowatts of power by obeying gravity and falling. The white box in the middle of the picture is one of Vycon's crane flywheels. 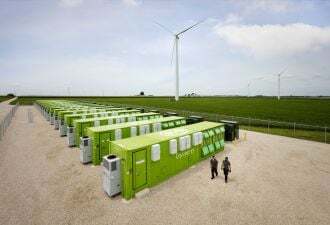 The company’s basic flywheel can capture and discharge 300 kilowatts of power and several of the modular units can be ganged together to deliver megawatts of power. The running price hovers around $1 million per megawatt. Right now, Vycon produces around 300 units per year. While transit agencies are direct customers, one could imagine utilities underwriting a portion of any installation. The evening commute, after all, hits right in the middle of the peak power hours.